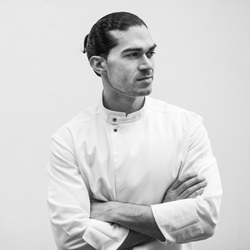 Jozef Youssef founded the collaborative gastronomic project, Kitchen Theory, to explore the multi-sensory elements of eating. An experienced chef with stints at The Connaught, The Dorchester and The Fat Duck under his belt, he has worked with scientists, chefs and artists to further his knowledge in this fascinating area. He is the chef-patron of the Kitchen Theory experimental dining experiences as well as the author of Molecular Gastronomy at Home, a simple introduction to the science behind modernist culinary techniques.